The HMS students and staff had a chance to recognize and celebrate Nini Emmons, Yarmouth's Partner In Education Volunteer Coordinator, as she neared her retirement at the end of December. We wanted to thank Nini for all she has done for our school and our district during her time in Yarmouth. Nini's passion led to an impactful and lasting legacy for Yarmouth schools, which students, staff and our community will continue to benefit from moving forward. Nini was tirelessly committed to creating opportunities for youth mentorship. She recognized the positives and growth that occurs when students have the opportunity to provide guidance and companionship to others. Her work built the foundation for these opportunities in our schools and she has provided training and support to countless students who have learned essential life lessons from these roles. Nini developed the Clipper Friends program from the ground up, ensuring training for all students involved and creating matches that were a gift to mentors and mentees alike. She also vetted and arranged for adult volunteers, and mentors and tutors K-12, always identifying individuals whose time, efforts and interests would most effectively support our students. Nini ensured Yarmouth's participation in the annual Day of Caring for YHS students, working alongside them during these special opportunities. She was the driving force behind the YES Grandparents Day, HMS Career Fair and fundraising, and countless school and district fundraising/community building efforts. With Nini in the role of HMS Student Leadership advisor, our students benefited from her caring guidance and the expertise she shared about community outreach. Nini also worked to support the 5th grade Colonial Craft day, and many other events too numerous to include here. Nini devoted her career to ensuring that our students have what they need to learn from each other and support each other. We thank her for her unsurpassed dedication and commitment to our schools! Nini and her husband Chris will be traveling and enjoying time with their daughter Sophia and their family in the months to come. We are thrilled for them and wish them well. 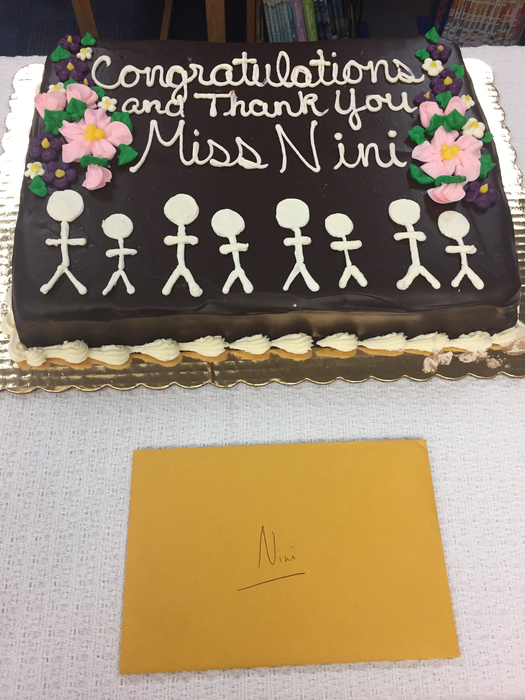 We will miss Nini more than we can say and look forward to catching up with her when she returns!